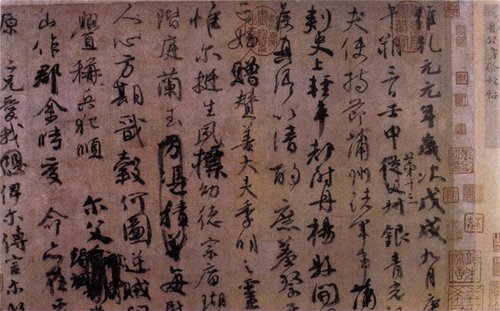 Ji Zhi Wen Gao, written by Yan Zhenqing, a calligraphy master from the Tang Dynasty (618-907). It contains altogether 234 characters. Now it is collected by the Taipei Palace Museum. The Taipei Palace Museum's loan of a nearly 1,400-year-old calligraphy, which is considered one of the most precious Chinese treasures, to a Japanese museum has sparked outrage among cross-Straits netizens who condemned the Taipei museum of "flattering Japan and causing severe damage to the precious antique." A Sina Weibo user posted a photo on Saturday of a poster of the exhibit of Japan's Tokyo National Museum, saying an unrivaled work of calligraphy by Yan Zhenqing (709-785), one of the most influential Chinese calligraphers during the Tang Dynasty (618-907), will be displayed from Wednesday to February 24. The work was written by Yan to his nephew and is part of the Taipei Palace Museum's collection, according to the introduction on the website of the Tokyo National Museum. The user condemned the Taipei Palace Museum, which loaned the masterpiece to the Tokyo National Museum, for lending such a fragile treasure. An employee of the Tokyo National Museum told the Global Times on Monday that the calligraphy has been placed inside a glass box and the museum allows visitors to take photos as long as they do not use flash. However, another employee changed the statement in another interview by the Global Times later, saying that visitors are banned from taking photos to protect the cultural relic from harm. "Visitors who take photos of the work of calligraphy in the glass case will affect the cultural relic," said Gong Decai, a professor at the University of Science and Technology of China. Liu Zheng, a member of the China Cultural Relics Academy, told the Global Times that sunlight would seriously harm the ancient paper, so the relic is in jeopardy while being transported. "The Chinese mainland prohibits valuable cultural relics, especially paintings and calligraphy, from leaving the country," Liu said. Media reports from the island of Taiwan said the calligraphy is considered very precious, which is also one of limited exhibits among 70 items in the museum because of the vulnerability of the ancient paper. Though in the island of Taiwan, Yan's calligraphy has not been displayed publicly in 11 years and the last overseas exhibit was in 1997 in the US, so as to protect the cultural relic, according to the report. Netizens in the island of Taiwan denounced the museum as too "generous" to Japan's museum. "I need to fly to another country to appreciate our treasure," netizen Wu Mengru, who is a student at National Taiwan University, wrote on Facebook.